As many of you will know, Capytech has created a great niche in the UAE/GCC market developing custom e-learning content. We’ve delivered to great companies like DP World and Majid Al Futtaim, as well as government entities like the Prime Minister’s Office and the Ministry of Human Resources. We were missing something though. I had deliberately focused on custom content to set ourselves apart from our competitors who primarily re-sell other companies’ content. In 2018 I missed out on a couple of great deals because we didn’t have an offering in this space – and I HATE missing out on deals. I started searching for companies that have off-the-shelf content (pre-developed) that would be suitable for this market, and that would be a good fit for Capytech’s services and approach. After much searching, we found the perfect partner. GO1 is headquartered in Australia and is the world leader in online learning and education. It has partnered with around 50 (and growing!) content providers and has developed a platform to provide a Netflix-style method of delivery. It has more than 1 million users and is a graduate of Y Combinator. GO1 has offices in the US, UK, Malaysia and Vietnam. As the world’s largest compliance, professional development and general training marketplace, GO1 makes it easy for businesses to train their staff. By providing a single platform that extends from first aid training through to degree-bearing courses, GO1 makes it easy to find and compare the best training options available. GO1 has more than 500,000 courses and other learning items created by Australian and international experts. The platform is used by organisations of all sizes including global toy and board game giant Hasbro, Japanese carmaker Suzuki, car rental provider Thrifty and government agencies. Because GO1 has many partners, users have several to choose from – if you prefer one style over another, we can accommodate this. The modules can be delivered on Capytech’s LMS, the GO1 system or on any SCORM-compliant LMS (Learning Management System). 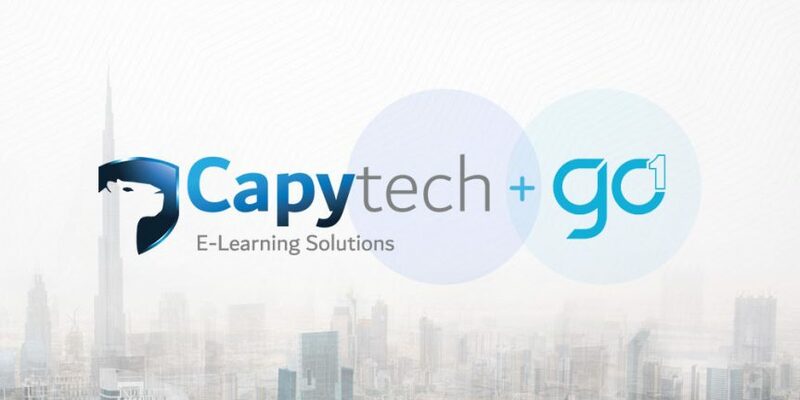 Combining GO1’s off-the-shelf materials with Capytech’s custom content offers truly complete e-learning solutions. Let’s say you want to implement an induction program for your sales staff. You might develop a custom module or two introducing your company’s history, vision, services and so forth. You might then have them run through a number of GO1 Sales modules that best suit your company’s style. Then you might round off the training with a custom module explaining your specific processes or tools. This is a great way to leverage both the power of customisation as well as off-the-shelf e-learning in a cost-effective manner. There are any number of similar scenarios where you might apply this principle. If you are an L&D manager and have just turned on your new LMS, we can now give you a huge catalogue of courses on your system in a very cost-effective way. Of course, every company is different, and I’d love to explore what solution might suit you best. I’m super excited about this partnership and the path ahead for us together. If you want to learn more please get in touch with us and we’ll be more than happy to show you around! Alternatively, you can sign up for a free demo account on this link. Enjoy!